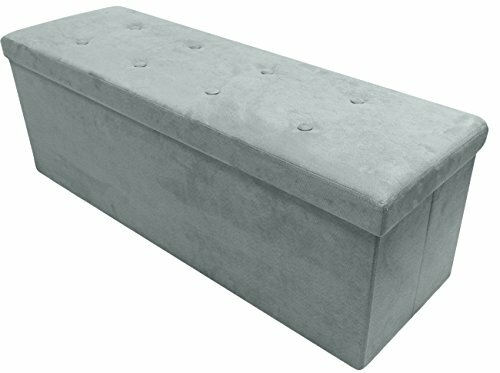 The Sorbus® Suede Storage Bench Chest is an attractive, functional, and sturdy accent piece and storage compartment. Finely crafted with superior faux suede this multi-purpose furniture piece features cushioned padding for seating, meticulous top stitching, and classic button-tufting details. The standout design blends well with other furniture and interior décor motifs. No more plastic storage bins and unattractive boxes, convert your space into a decorative and functional oasis! This faux-suede storage bench has a remarkably sturdy design that is lightweight until you pack it with your items of choice. Assembly is quick, easy, and no tools are required. To use, simply lift the lid on the storage bench to stow away or retrieve items. Measures approximately 43" L x 15" W x 15" H.